Winner of a Books for a Better Life award! Gene Baur, the cofounder and president of Farm Sanctuary, the nation's leading farm animal protection organization, knows that the key to happiness lies in aligning your beliefs with your actions. In this definitive vegan and animal-friendly lifestyle guide, he and Gene Stone, author of Forks Over Knives, explore the deeply transformative experience of visiting the sanctuary and its profound effects on people's lives. 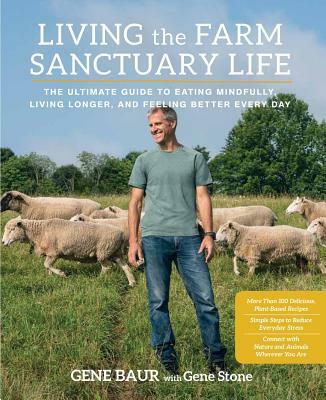 The book covers the basic tenets of Farm Sanctuary life—such as eating in harmony with your values, connecting with nature wherever you are, and reducing stress—and offers readers simple ways to incorporate these principles into their lives. Living the Farm Sanctuary Life also teaches readers how to cook and eat the Farm Sanctuary way, with 100 extraordinarily delicious recipes selected by some of the organization's greatest fans—chefs and celebrities such as Chef AJ, Chloe Coscarelli, Emily Deschanel, and Moby. Coupled with heartwarming stories of the animals that Farm Sanctuary has saved over the years, as well as advice and ideas from some of the organization's biggest supporters, Living the Farm Sanctuary Life is an inspiring, practical book for readers looking to improve their whole lives and the lives of those around them—both two- and four-legged. Gene Baur is the cofounder and president of Farm Sanctuary and was named "the conscience of the food movement" by Time magazine. He has been featured in the New York Times, Los Angeles Times, Chicago Tribune, and the Wall Street Journal, among many other print outlets, and is a frequent guest on television. He lives in Washington, DC. Gene Stone is the author of nine bestsellers, including the #1 New York Times bestseller Forks Over Knives. He lives in New York City.